Perfect item for keeping your purse safe and secure when dining out. Don't keep your bag in your lap or on the floor. Hang it from our Purse Hanger and you know where it is - safe and sound. Hanger is about 4" long overall, with a recess to fit a 25 mm (about an inch) diameter cabochon or fused piece. Non-slip rubber backing on back keeps things in place. A handy gift item. Everybody has one, so why not a classy one with a fused glass insert. 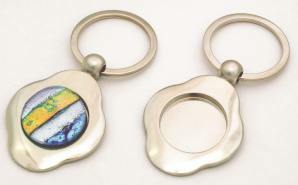 Made with a recess spot to fit a 25 mm (about an inch) diameter cabochon or fused piece. You need a way to stick your glass to these accessories. CLICK HERE to see our selection of reasonably priced adhesives for the job.